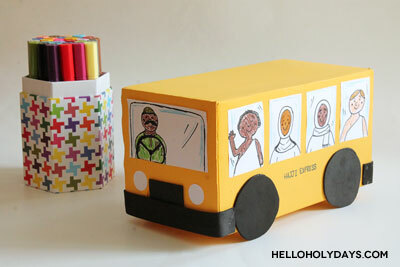 Hajj Bus Craft – Hello Holy Days! Don’t let the pilgrims miss their Hajj bus! 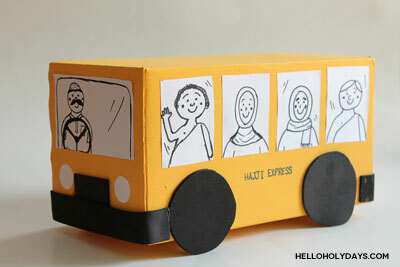 Make this Hajj bus craft to help pilgrims get from one Hajj destination to the next! There are many different destinations pilgrims need to travel to in order to complete their Hajj. The city of Mina, the plain of Arafat and the area of Muzdalifah. No matter where in the world pilgrims might fly in from, once they’re in Mecca, there’s only one way to get to the various destinations of Hajj and that’s by bus! 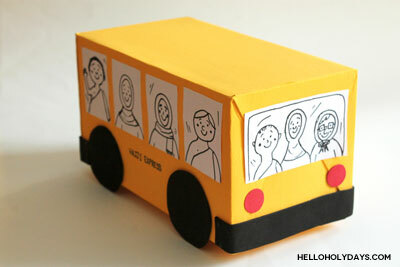 Kids will love constructing the bus, coloring in the pilgrims and then taking the bus around for a spin! It’s a great activity for a lazy afternoon leading up to Eid al Adha. Paint the cardboard box yellow. If you start with a white or lighter colored cardboard box, you’ll require less coats of paint. The box I was using had a lot of black and therefore took many coats of paint to make it yellow! 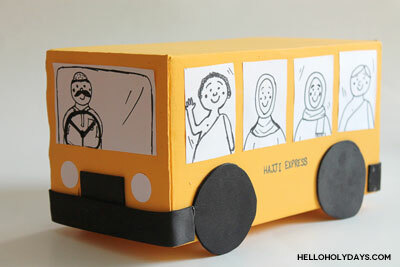 Cut out rectangles from the white sheet of paper to be the windows on your bus. Draw pilgrims on the rectangles and a bus driver with markers. Glue onto the bus. Cut out circles from black foam. Glue onto bus as tires. Add details to the bus. I cut out two strips from black foam to be the front and back bumper of the bus. I also cut a small rectangle from the black foam to add to the front of the bus, above the bumper. I used a 1″ circle punch to punch out white headlights for the front of the bus and red taillights for the back of the bus. Color in your pilgrims and take your bus for a spin! *Note: I’ve used foam tires here more for decorative purposes than actually creating a bus that can roll well. If you’d like to create a bus that performs like an actual bus, I suggest using wooden dowels and wooden circles for your wheels. These foam tires hold up well in the sense that the bus stands upright and can wheel around a little bit when gliding with your hand. Special thanks to Kid Made Modern for the markers! Do you have a template that I can use?